This particular wedding was co-shot by Rachael and myself (Mairen) and like so many moments leading up the wedding - it was perfect synergy. We have to tell you, that when we have the opportunity to shoot a wedding together it always ends up being a magnificent result. An unspoken, yet perfect compliment to one another's images to round everything out and create a lovely fullness to reliving the day long after it's passed. There is a fine balance to what makes for a ideal wedding shoot from the photographers perspective and this is a perfect example of everything coming together to create images that represent what we do best. From the first time met, we fell in love with Lauren & Mike and their fox and foody themed wedding in Lake of the Woods. It was clearly a perfect fit for us and them. They gave us the freedom to do what we do best and in turn they were able to completely be themselves. It was a celebration full of character and uniqueness. And, not to mention, bar none one of the CRAZIEST DANCE PARTIES EVER! The fact that there was literally a trophy for 'Best Dancer' awarded that night. 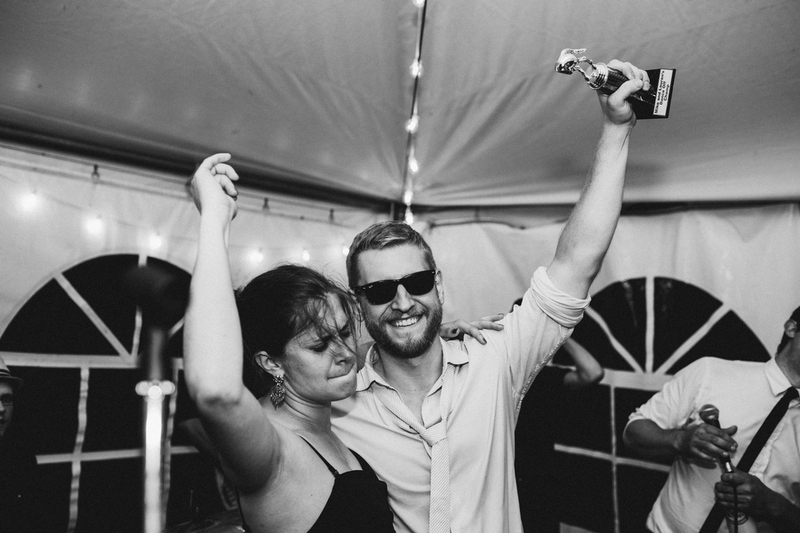 And if you know Rachael and I at all this is the ONE thing we strive for on a regular basis... to be in the middle of said dance parties, shakin' our booties right along with everyone else (secretly vying for that coveted trophy). We love love LOVED being welcomed into the fold of this wedding. Getting to know Lauren and Mike and to be able to capture them and their eclectic, quirky and wonderful family and friends was an honour and a privilege. ps. Mucho props go out to Tammy and her team from Divine Weddings for their role in said nuptials. Always love working with them and always impressed at how each wedding they work on is completely unique!